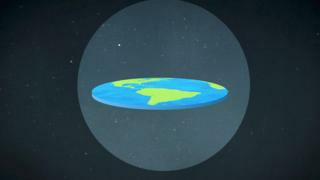 YouTube is playing a significant role in convincing some people that the Earth is flat, research suggests. A study quizzed people at flat earth conferences and found most cited videos viewed on the site as a key influence. They were won over by videos which claimed to amass evidence proving the Earth was not a spherical planet. YouTube needed to do a better job of ensuring visitors get accurate information alongside such videos, said the researcher behind the study. "There's a lot of helpful information on YouTube but also a lot of misinformation," Prof Asheley Landrum from Texas Tech University, who carried out the study, told The Guardian. The algorithms the site used to guide people to topics they might be interested in made it easy to "end up down the rabbit hole" of misinformation, said Prof Landrum. "Believing the Earth is flat is of itself is not necessarily harmful, but it comes packaged with a distrust in institutions and authority more generally," she added. The study involved interviews with 30 attendees at two conferences. Questioning revealed YouTube had suggested the flat earth videos after attendees had watched other clips at home about conspiracy theories. Some said they only watched the videos to criticise them but were won over by the arguments being advanced. The results from Prof Landrum's study were presented at the annual meeting of the Association for the Advancement of Science this weekend. Prof Landrum said there was a need for scientists and science advocates to produce their own YouTube videos that answered and debunked the claims of flat earthers and conspiracy theorists. "The only tool we have to battle misinformation is to try and overwhelm it with better information," said Prof Landrum.